The sheep rancher, meanwhile, says his former employee was semi-retired and allowed to continue living and eating for free at the ranch, with a driver and access to the outside world just a phone call away. The facts of the case will likely be sussed out in federal court over the next several months, now that Idaho Legal Aid has filed a lawsuit on behalf of the sheepherder, a permanent legal resident from the Basque region of Spain named Sabino Leibar. But the case highlights the lack of direct oversight for agricultural businesses that rely on foreign workers. According to the lawsuit, Leibar started working for John Anchustegui in 1981 in a rural area near the tiny village of Bruneau in the southwestern corner of the state. Now 74 years old, Leibar contends Anchustegui prevented him from getting a driver's license, and since he speaks only Basque and a little Spanish, he was unable to get help when he needed medical care, food or transportation. Anchustegui, meanwhile, told The Associated Press in a phone interview that those claims aren't true. "He's not quite painting an accurate picture of the situation. We've done a lot for him - he's settled into a state of dementia, I'm thinking," Anchustegui said. "He's the only one who has ever complained about anything like this. The case is fictitious slander to say the least." Anchustegui said he planned on filing a counter claim against Leibar. "He got free room and board for doing absolutely nothing," the rancher said. "He started to get social security around 2008, and kind of went into semi-retirement. And I let him stay there." Leibar contends he is owed nearly $264,000 in minimum wages from Jan. 1, 2009 to May 2, 2017. He says Anchustegui made three partial payments for wages during that time, for a total of just $46,000. Anchustegui contends he was paying Leibar about $1,000 a month during that time span in addition to providing the free room and board. "My impression is he feels he escaped and he does not want to go back," said Leibar's attorney, Erik Johnson with Idaho Legal Aid. "I think it's taken a huge psychological toll on him. Physically, he's got some problems - he's got back problems, he's got heart problems, but he is a strong, strapping guy." 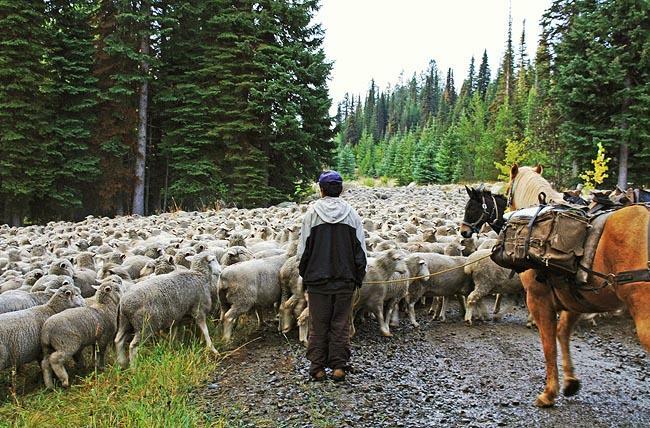 Sheepherders frequently spend weeks at a time on the range, moving their flock to new grazing locations and bedding down beside them in the wild to keep predators at bay. They typically return to larger campsites or bunkhouses for lambing and shearing, and often have winter months off when heavy snow cover and harsh weather conditions makes forage inaccessible for the herds. Nationally there has been a push to increase oversight for businesses relying on foreign workers, said Leo Morales, the executive director of the ACLU of Idaho. Worker advocates in states like Colorado have strong worker protection campaigns underway, he said, in hopes of ensuring all businesses are following rules intended to improve worker safety and economic stability. "But there is not much oversight in general with regards to these guest worker programs, and that's even more true of workers who are in remote areas. Idaho has a history of this too, with employers getting fined because of violations of treatment of their workers," Morales said, referring to some forestry firms that were investigated and fined for violating foreign workers' rights by failing to pay them and provide adequate housing and living conditions in the mid-2000s. The penalties for failing to pay workers properly are not very big, Morales said, which can put workers at a disadvantage because there is little incentive for large employers to comply. Still, repeat violators can eventually lose their ability to participate in visa programs for foreign agricultural workers. Anchustegui has been fined twice for violating federal Wage and Hour Division rules on paying workers, according to records from the U.S. Department of Labor. The first fine was for $3,000 after the agency said he committed three violations involving one employee between 2002 and 2004. The second fine was for $9,000, after the agency said Anchustegui committed nine wage and hour division violations involving three employees between 2007 and 2009. Anchustegui's attorney, Brian Julian, did not return repeated calls requesting comment. The Idaho Department of Labor, which is tasked with helping oversee agricultural worker protection programs, declined to answer questions about the case, but agreed to answer general procedural questions via email. "USDOL regulations specify state workforce agencies like the Idaho Department of Labor must assist farmworkers who file complaints and we must report apparent violations of employment-related laws that we observe or receive via reliable and verifiable information," spokeswoman Georgia Smith wrote in an email to the AP. The Idaho Department of Labor declined to answer questions about whether any action had been taken in regards to Leibar's claims. But Leibar's attorney, Johnson, said department officials told him they filed a "notice of apparent violation" with the U.S. Department of Labor, which could trigger further scrutiny from the federal agency.